2009 Buddy 125 $1700 SOLD! 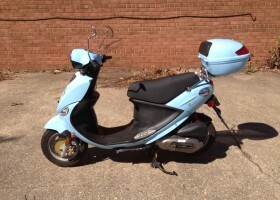 On consignment is this 2009 Blue Genuine Buddy 125 with just under 5,000 miles. Aesthetically very clean. Runs well. Comes with top case and Genu-bin cup holder. $1700. We’d consider $1600 if you show up with cash.